She in charge of a department she despises. DeVos did not initially know the Individuals with Disabilities Act (IDEA) was a public program. She said she thought it was something the states could decide to enact or not. IDEA is a Federal law which requires public schools to provide appropriate education to students with disabilities and provides legal due-process when students feel that those rights have been violated. She made efforts to connect her supposed support for IDEA to her strong anti-abortion stance. 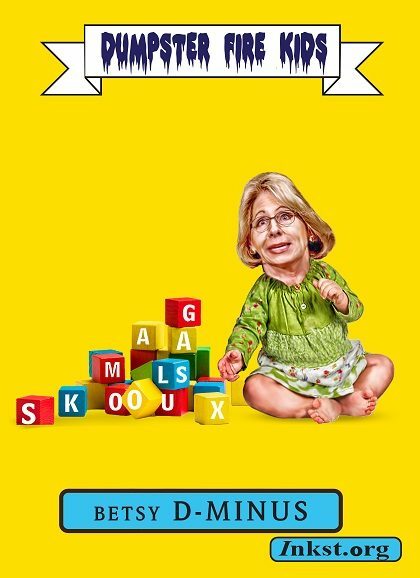 She bankrolled a private school voucher measure in Michigan, which voters defeated by a ratio of two-to-one. After that failure, Betsy DeVos spent millions electing legislators who would further slash the state’s public school budgets. DeVos and Trump would eliminate teacher professional development programs, and eliminate funding for over 35,000 teachers. Betsy Devos wants to divert educational improvement funds into private schools and religious schools. Specifically, she will dismantle the Education Innovation and Research Program. This progroam funds and encourages research into improving and creating educational programs. Simply, this program funds research into educational models and takes the best ideas and helps to integrate them more broadly. This is literally the program that improves American education. Trump’s budget funnels more than $1 billion to new market strategies and vouchers, even after a study which concluded that children are the sole sufferers in this scenario. We already showed her actions and philosophy regarding charter schools in previous examples. She also supports putting more funding to religious schools, which is really just boilerplate republican goose-stepping across the separating line between church and state.